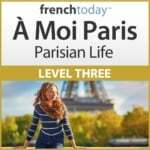 People are clamoring for the green pearls of Le Puy. 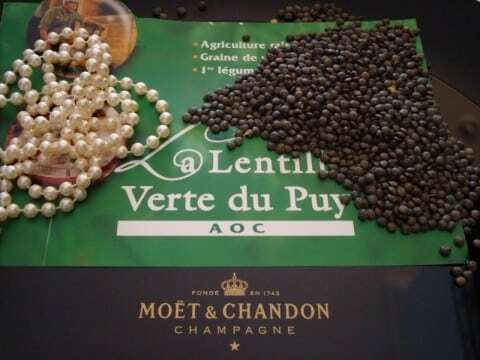 Not pearls of “haute couture”, but pearls of “haute cuisine”, known as “la lentille verte du Puy”(pronounced pwee), the green lentils of Le Puy in the Auvergne region of France. Twenty years ago, according to Jean-Louis Rocher, author of La Lentille Verte du Puy, no one liked lentils. They weren’t in vogue. Thanks to Félix Amargier, a passionate lentil producer who pushed for the prestigious AOC designation awarded in 1996, now even starred chefs use this poor man’s caviar in their cuisine. Régis Marcon, a three-starred chef, was one of the first to use the lentille verte du Puy in haute cuisine. At his restaurant in Saint Bonnet le Froid in the Auvergne, he’s proud to use the lentil of Le Puy in everything from appetizers to desserts. Pierre Orsi, a starred chef from the Relais Gourmand restaurant in Lyon, says “the simplicity of the lentil heightens all the flavors” of a dish. The exceptional qualities of these lentils come from Auvergne’s rich, red volcanic soil and the unique microclimate of Velay. Lentils are rich in fiber, protein and minerals, easily digestible, reasonably priced, with a meaty flavor. This ancient, simple legume, once ignored, is now the pearl of haute cuisine. If you like lentils, make sure to check out Debra’s recipe!